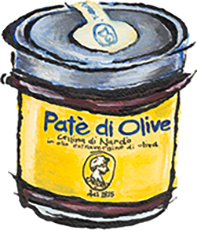 Pate di Olive for sale. Buy online at Zingerman's Mail Order. Gourmet Gifts. Food Gifts. Sincere attention to a lack of progress. I visited Caricato about a dozen years ago. It was a business living in the last century, and by that I mean the one before the last one. No one spoke English, they had a friend come over to translate. We started the afternoon in the parlor on the second floor, all the shades drawn because even in May the Southern Italian heat was melting its way in. The mother, the father, the son—the entire business—met and we talked about olives. Later they took me to see the press. It was stone and that was the last time I’ve ever seen a stone olive press, they’re all stainless steel now. They took me to the farm. It was a mixed planting field, rows of olive trees were interspersed with artichokes and grapes. It was the only time I’ve ever seen an Italian farm planted that way, they’re almost all monoculture now. The farm’s paths were flowered in chamomile. There was a hundred year old caper bush, its trunk as thick as a pine. I must have made a scene about it because when I left that night I was given a shoe box full of capers. I portered them back to Ann Arbor and gave them to the crew. All this has nothing specific to say about this olive paste. It’s just black olives, crushed and salted. If you like that kind of thing, and imagine how Caricato’s poignant lack of progess affects such simple foods, you can guess how good it tastes.